Hamilton: The Revolution by Lin-Manuel Miranda and Jeremy McCarter is three hundred pages of wonderful, unadulterated squee. It’s a companion to the musical that I’ve been listening to nearly non-stop since last September, a documentation of the development of a show that’s clearly going into the canon of American theater and has already burst the boundaries of Broadway success. Because nothing says “massive Broadway hit and cultural phenomenon” like “based on an 800-page biography of a Treasury Secretary who’s been dead for more than 200 years,” right? And yet, that is precisely what it has become. Over the last nine months, since its Broadway debut, Hamilton has exploded into popular culture. Its original cast recording had the highest debut on Billboard’s album chart since 1963. For good measure, it also debuted at number three on the rap album chart. The musical was nominated for a record 16 Tony awards, and won 11, one win shy of an all-time record. After the Tony awards, the album became one of only three cast albums to reach the Top Ten in the last 50 years. An entire subculture is growing up around Hamilton, with tumblrs, pastiches, and related items just a small part of what fans are producing. A Chicago run opens later this year; national touring companies will begin on the West Coast; the show is set to run in London next year, and I am already on the mailing list for information about that one. Some months ago, a friend who saw it a couple of times while it was in development at the Public Theater asked whether a singalong at a Brooklyn bar was an indicator of peak Hamilton. Not a chance, I replied; just you wait. To give a far too truncated summary, the show tells the tumultuous story of Alexander Hamilton, a leader of the American Revolution who died in a duel in 1804 and was largely overshadowed by other founders who outlived him. The musical draws directly on the 2004 biography by Ron Chernow, who became an advisor to the show. Lin-Manuel Miranda wrote the music and lyrics, and he played the title role. The book is also already a piece of history, with recent news that three stars of the original cast of Hamilton — Miranda, from the title role; Phillipa Soo, who plays Hamilton’s wife Eliza; Leslie Odom, Jr., who plays Hamilton’s nemesis Aaron Burr — will leave the production in July 2016. Miranda originally conceived of Hamilton as a concept album. His first Broadway play, In The Heights, had won a Tony for best musical, and on the strength of that work Miranda was invited to close out a White House evening of poetry, music and the spoken word in May 2009, one of the first major artistic events hosted by the then-new Obama administration. The White House probably expected him to perform something from In The Heights; instead, he debuted the first number from Hamilton, calling the Treasury Secretary someone “who embodied the spirit of hip-hop,” someone whose life showed the difference that written words can make. The Revolution in the book’s title is only partly a tip of the tricorne to the era that Hamilton lived in and shaped. It’s also part of the argument that Hamilton itself is making a revolution in American musical theater. First off, much of the production is hip-hop. That’s one of Miranda’s natural musical idioms and was also prominent in In The Heights. But rap had not previously fared well on Broadway, even though hip-hop has been around for going on 40 years now. On the theoretical level, Miranda makes a three-fold argument: the lyrical density of rap makes it possible to communicate much more to an audience than older styles of Broadway songs; that using rap as the form for a story rather than as its focus makes all the difference; and that the Revolution’s quest for self-governance and self-definition is a quintessentially hip-hop story. The real argument, though, is the play itself, and it’s irrefutable. Rap is now part of the Broadway lexicon; that world will never be the same. Second, virtually all of the original cast members are people of color. “Chris[topher Jackson, who plays George Washington] knows that plenty of people in America are uncomfortable with a black president. He also knows the symbolic power of Hamilton having three of them.” Hamilton shows the personalities and disputes that were rife during the American revolution and the early years of the republic. Many of those questions are still live ones in American political life today. Throughout the book, cast members talk about how the choices made in producing Hamilton have opened up roles for actors of color that are just not present in standard Broadway fare. They also talk about how seeing icons of the Revolution played by people like themselves would have changed their relationship with history if Hamilton had been around when they were in school. More than one said their work in the play made them feel more connected to the country. 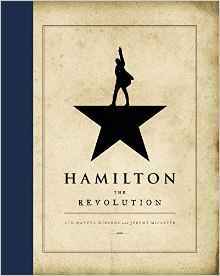 The book follows Hamilton‘s development from that first White House performance, alternating concise anecdotes that focus on one aspect or period of production, with annotated lyrics. It is, as they say, lavishly illustrated. The stories are neat. I don’t know much about how a Broadway show gets put together, so I learned a good bit. All of the main actors are featured in an individual chapter (most chapters are three to five pages; this is a mostly visual book after all), as are key off-stage people such as the producers, director, musical director, and so forth. The texts are also discreet about missteps: the actors who didn’t quite fit as Burr in early workshop rounds are not mentioned by name, nor is the widely respected Broadway composer who gave Miranda advice about some songs, which he completely ignored in the end. One topic that I think could have been explored more, even within the context of this kind of book, is the financing of the play. That would have fit the subject matter. Hamilton was Secretary of the Treasury, and his financial acumen set the state for the emergence of the United States as a global power. Thomas Jefferson, who is Hamilton’s second-biggest rival in the play, calls his financial system “a work of genius … I couldn’t undo it if I tried.” (He then adds, “And I tried.”) There are hints of it in the narrative of the show’s development. The section about the recording of the original cast album mentions how much more studio time Hamilton had than most musicals do. It also said that the usual process was to mic the room and record groupings of actors, whereas Hamilton recorded everyone individually. That implies that Hamilton had more resources—more money—to put into making the cast recording. There’s a mention of investors who wanted to get in on the action after they had seen early versions of the play. There is the depth of realism put into the props. Resisting pressure to get to Broadway as soon as possible also suggests that Hamilton the production had the resources to work through all the variations that the creators’ artistic talent produced and find the ones that worked best. Hamilton himself would have been very interested in all of the details, and finance probably foremost among them. Still, that is a very minor quibble. Hamilton: The Revolution is a delight, a book that extends and expands on the play, and a way for someone who won’t see the New York production to view what happens in the rooms both on stage and behind the curtains. Squee!